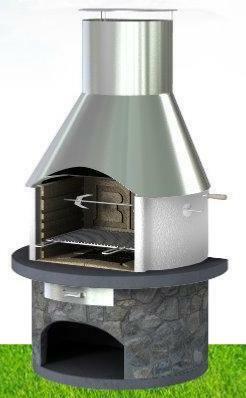 With its unique oval shape and stainless steel chimney, the Rondo is a high quality BBQ for your garden. It can be equipped with the whole range of barbecue accessories such its very own smokehouse or pizza oven - which is what makes the Rondo the most luxurious masonry BBQ. Delivered to your door with full instructions, assembly is very easy and can be completed in a short space of time. Can be fired using charcoal for a great taste on your BBQ. Air is drawn in through the underside of the BBQ to create a reliable and hot grill. Includes cooking grill and fire tray, instructions along with a manual rotisserie spit. Grill Size - 58 x 40cm. Dimensions 206cm x 119cm wide x 77cm deep. 7 to 14 Days Delivery. 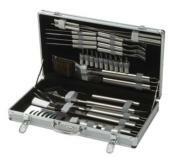 Large 30 Piece Stainless Steel BBQ Tools. Set in an Aluminium Case.